The seven Avatar Mini-Courses are your opportunity to see and feel how empowering the Avatar tools can be. These are single copies of the same mini-courses contained in the Seven Pillars of Enlightenment. Invest TWO DOLLARS and choose the course that interests you most. What an incredible gift I have just received while doing the Integrity mini-course and looking at all the ways I avoid taking responsibility and stepping up to do what I would love to do—be in service to others. What amazes me is I have found a place where my game, that kept me stuck, can no longer be played. And it happened faster than ever before. The jig is up, and it’s time to step up and be in service and share the incredible gifts I have received. Thank you for not quitting on me and helping me to see how destructive it has been to quit on myself throughout my entire life. Wow, a whole new life is about to begin! I have just finished a mini-course with my wife. While doing Releasing Fixed Attention with her, I am totally amazed at this being in front of me. Dropping my own filters around her and seeing a whole new side of her, I am again amazed at the simplicity and the beauty of the Avatar tools. The biggest thing though is seeing my connection with her grow deeper with each shift of attention. Laughing together about the realization she had, connecting on a whole different level, once again shows me the power of these tools. Once again I thank you with all my heart. For anyone who has secondaries around really connecting and inspiring their loved ones and close family members to do Avatar (as I have had so many times), any secondary that you could create is nothing compared to the simple joy of sharing Avatar. The freedom and the empowerment that you can share with those close to you. The fun and lightness you can create together. Go for it . My work with the mini-courses was an awesome experience. Doing the Forgiveness Option was very enlightening. I started my Burdens of Life chart as a victim. By the time I got through several rounds of the Releasing Fixed Attention exercise, I began to realize how I was being and showing up in the world. It made sense. Then I worked with the Personal Integrity mini-course. I took responsibility for what I was creating. I felt empowered, happy and blessed to have the opportunity to be here now at this time on the planet. Words do not describe the gratitude I feel. The Personal Integrity Mini-Course is a powerful awareness booster; try it for yourself. Allow yourself to be truly honest about what you find. You can expect improved well-being, insights into attacks and disagreements, and a freeing of creative energy. The Basic Attention Mini-Course explores ways in which human attention, the most valuable of all commodities, can be preserved and even restored. The course focuses on experiential exercises that are self-instructive. The Basic Will Mini-Course explores the non-physical quality that makes choices and decisions, controls motion and attention, creates and perseveres—human will. The exercises are designed 1) to increase your understanding of the functioning of will, and 2) to increase your ability to function deliberately. The Creating Definition Mini-Course explores the definitions that exist between non-physical being and the stuff of this universe. The exercises in this course are designed to illustrate, in an experiential way, the nature of being, its creative abilities, and the nature of definitions. The Forgiveness Mini-Course explores the consequences and the process of forgiveness. On rare occasions, life offers us the opportunity to rise above the chains of causes and effects, and for a moment, as an Avatar source being, to determine the direction of future events. Forgiveness is such an opportunity. The Belief Management Mini-Course explores the relationship between your beliefs and your experiences. Knowing the frame of reference of the observer is essential to evaluating the truth of an observation. Since the belief management procedures of Avatar directly address the consciousness that uses them, they are self-adapting to the level of existence being experienced by the person. The Basic Life Alignment Mini-Course explores the relationship between attention, motivation, and goal setting for the purpose of aligning with your life’s purpose. It seems easier to defend actions than to honestly examine them. We are quicker to attack than to admit. Admissions require courage! When we summon the courage to take ownership of our experiences, to see them just as they are, to feel them, we will recover the blueprints of our lives. We will face our fears and find the transparent beliefs that create them. Becoming more honest with ourselves means introducing more honesty into the collective consciousness of the world, and this lays a foundation upon which an enlightened planetary civilization can be built. Instincts don’t require you to make decisions. There is no weighing of consequences, no interests to consult, no regrets, and no mistakes. You don’t have to stop and scratch or figure anything out. There is no karmic consequence. You just react: stimulus and response, fight or flee, eat or be eaten, survive or pass away. You may find this sort of instinctive existence attractive —at least until it comes your turn to be eaten. Anyone wanting to improve the quality of their life. The full set of the Avatar Mini-Courses are available in Chinese, Dutch, English, French, German, Hungarian, Italian, Japanese Korean, Portuguese, Russian, Spanish. Belief Management, Forgiveness Option and Personal Integrity are available in Polish. 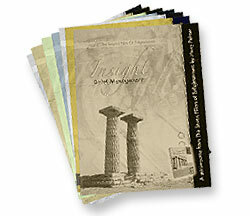 Bulk pricing is available for these booklets.